I just finished a recording of the Fantasticast podcast with hosts Steve and Andy, in which we talked about Fantastic Four #39. I was invited on the show because that particular issue features Daredevil as a major guest star, and I had a really good time. I will make sure to put a link up as soon as it’s available! However, there are two delightful scenes of comic book goofiness in this story that I wanted to share with you right away. 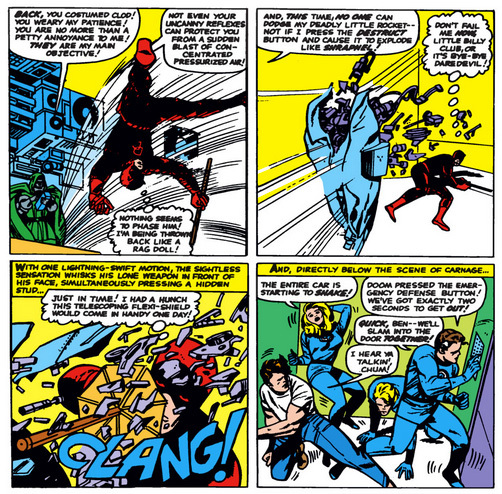 These panels are from Fantastic Four #40, the second half of the two-part story, in which Daredevil helps save the temporarily powerless quartet from a disgruntled Doctor Doom. But before we get there, some background information is in order. 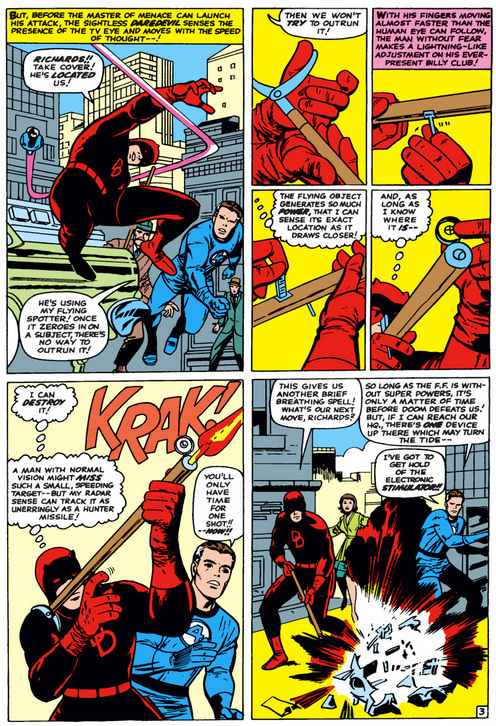 These issues of Fantastic Four, by Stan Lee and Jack Kirby, came out while Daredevil was still a new book, with just eight issues to its credit. As anyone familiar with Silver Age Daredevil will know, there was a lot of experimenting going on at that time, involving Daredevil as a character, his powers, and most definitely his billy club. The billy club has been a boomerang (Daredevil #4), some kind of curtain rod, complete with curtain (Daredevil #4), equipped with a smoke-screen (Daredevil #7), and “snoop scope” and miniature tape recorder (Daredevil #8). He has also used it as a holder for nutritional tablets (Daredevil Annual #1) and subway tokens (Daredevil #119). None of these instances comes close, however, to the absurdity seen in Fantastic Four #40. Let’s have a look. Is that a rifle? Why, yes it is! Daredevil isn’t a character we usually associate with firearms, and my guess it that we would prefer things stay that way. Particularly after seeing the scene below, in which Daredevil turns his billy club into a rifle. A rifle! Complete with a sight that Daredevil would have no use for at all. I just have one thing to say about this: WTF? Hahahaha. I love reading old comics and seeing stuff like this. At the time it was just so awesome, now its just funny. I really do wish we’d see more of the FF in Matt’s life as of late, but they are in space right now. Oh, how I needed a giggle today. Thank you. I’ve never seen this issue before and those gadgets crack me up, especially the telescoping flexi-shield (there is a lot of ‘telescoping’ action these days in DD). Interestingly, although most of us would agree DD wouldn’t pack a gun, there are companies that make gun canes. Here is a link I found. It even has instructions! Sadly, a quick search did not turn up anyone who could jam 30 feet of aircraft control cable into a billy club along with a mechanism to shoot it. Darn you physics! Yeah, Silver Age comics don’t get much weirder than this. Daredevil really was a master engineer. Actually, make that magician. Pingback: The Fantasticast Episode Forty-Four: The Other Other Murdock Papers Podcast Podcast | The Fantastic Flame On! I think this story got made into an episode of Fantastic Four the Animated Series. The episode was entitled “And a Blind Man Shall Lead Them”. In it DD helps save the FF, who had lost their powers, from Doctor Doom who had taken over the Baxter Building. It sounds pretty similar. Thanks for the laugh, these silver age posts always serve to lighten the day, much appreciated. I still think I like the subway tokens best though, its just so cheesy. I’m still waiting for the updated origin that explains that Matt is not only a top defense attorney, but also double majored as a mechanical engineer. He’s just a man of many talents haha. The overlooked aspect of the top panel is that if only the FF can get back to the Baxter Building in time, it will at last be one of Sue’s devices, and not Reed’s, that saves the day.